Alvin Ice Tubes are the coolest tubes around! Constructed of rugged PVC plastic, each tube is ideal for storage and protection of your valuable artwork and documents. 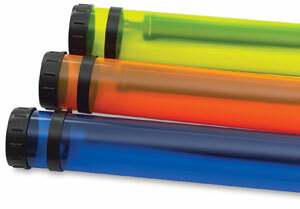 This moisture proof tube is sealed at one end, with an easy-to-use, removable cap at the other. An adjustable shoulder strap ensures extreme portability, which makes the Ice Tube perfect for students and professionals who use blueprints and charts. Each Alvin Ice Tube has a 2¾" (7 cm) inner diameter.